PRTA is in need of a website manager! PRTA Website team is in need of a dedicated website manager with HTML and css knowledge. Your work would include maintaining the site healty and stable. You will also have to work on projects and development of the website. If you feel ready and competent for this job, post below. Just as an "official" news post, our minecraft server is now fully operational and ready for all you minecraft players to join. I am sure Matt will edit this post, or reply with more details, but please make sure you obey the rules and most importantly have fun! Details and connection info can be found in the minecraft forum. Project Reality are proud to bring our Community some official Vanilla ArmA2 training prior to the release of PR: ArmA2 v0.1. 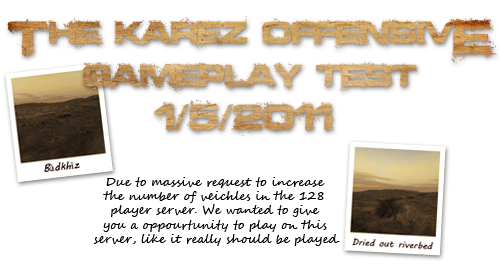 We will be holding open training nights over the coming weeks on vanilla Arma2 for all players new to this engine. Training will start @ 20:00 BST (UK) / 1900 PRT every Monday evening, for the next few weeks as we build up towards a release. This is a great opportunity for anyone who is looking to play the PR: ArmA2 Mod, from the PR: BF2 Community, and a place to get the "Basics" right prior to learning the PR style we all know. Welcome to the fith edition of the PR: ArmA2 Highlights Reel! Although this newsreel has been a while in coming, there has been a significant reason for this, the main one being there really was not too much to update on and also a large rethink of our priorities for v0.1. The team have continued however to work away in the background on a new Map, and as always constant improvments to the gameplay. Point to note, everything mentioned in this and any future Newsposts will now only relate to PR: ArmA2 v0.1 only. PRTA Website Head Moderator / Community Manager needed! PRTA is in need of a dedicated community manager / lead forum moderator for the PRTA site. The role requires one to actively take part in discussions, promote the community and do daily moderating and forum tasks. This Event will be on the 128 player server. and gaming from 1800 PRT and onwards. We will mainly use this map, but other maps will be used aswell! Welcome to PRTA's new forum! A fortnight later, and were back in business! So, where are we? We are using a new and exciting forum software called xenforo. To utilise the most of the new features we decided a fresh start was needed. There are many features ready to discover, and more features in the immediate future. The site is sill only an infant, and there are many areas rough around the edges. Please, if you have any criticism or suggestments reply to this thread or use the official suggestments forum. Many thanks, and viva la PRTA!